When you write a view, you’re writing a template: something that will get expanded to generate the final result. The render() method expects to find templates in the app/views directory of the current application. all instance variables of the controller. 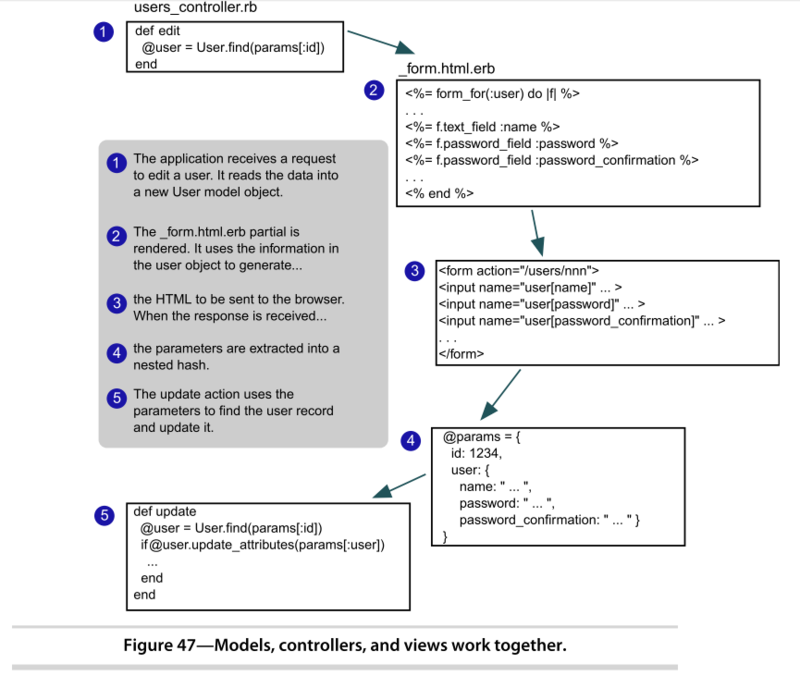 the controller object’s flash, headers, logger, params, request, response and session. 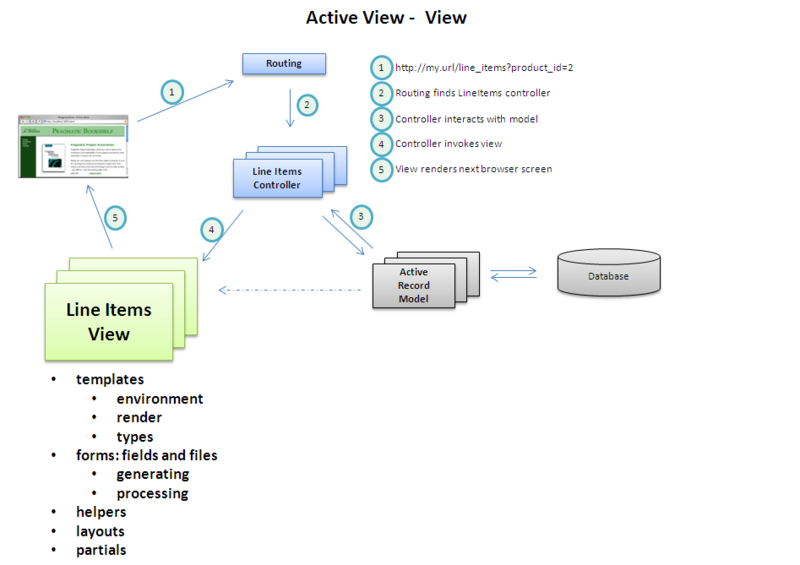 the current controller object(using the attribute named controller). the path the the base directory of the templates is stored in the attribute base_path. Builder tempates use the Builder library to construct XML responses. ERb templates mixing content and embedded Ruby to generate HTML pages typically. SCSS tempates create CSS stylesheet. HTML provides a number of elements, attributes, and attribute values that control how input is gathered. 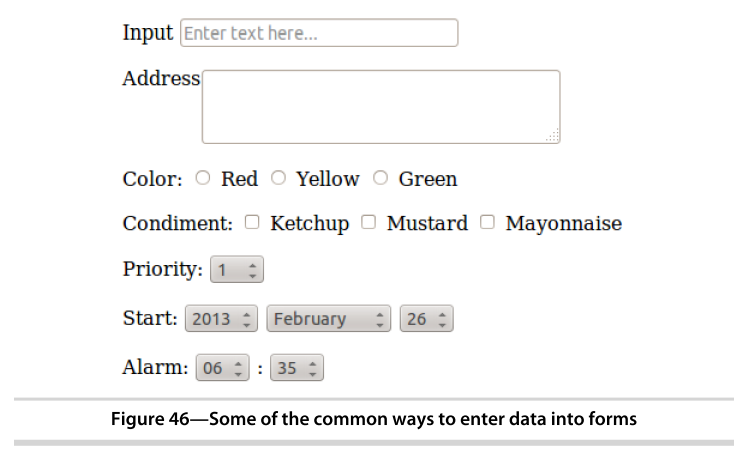 You certainly could hand-code your form directly into the template, but there really is no need to do that. Rails provides a number of helpers that assist with this process. Not shown in this example are hidden_field() and password_field(). A hidden field is not displayed at all, but the value is passed back to the server. This may be useful as an alternative to storing transient data in sessions, enabling data from one request to be passed onto the next. Password fields are displayed, but the text entered in them is obscured. This is more than an adequate starter set for most needs. Should you find that you have additional needs, you are quite likely to find a helper or gem is already available for you. A good place to start is with the Rails Guides. In HTTP, files are uploaded as a multipart/form-data POST message. As the name suggests, forms are used to generate this type of message. Within that form, you’ll use one or more <input> tags with type="file". When rendered by a browser, this tag allows the user to select a file by name. When the form is subsequently submitted, the file or files will be sent back along with the rest of the form data. If you’d like an easier way of dealing with uploading and storing images, take a look at thoughtbot’s Paperclip or Rick Olson’s attachment_fu plugins. the more code you put in the view side of your application, the easier it is to let discipline slip and start adding application-level functionality to the template code. This is definitely poor form and will pay off when you add new ways of viewing the application. html.erb is basically HTML, putting a bunch of Ruby code in there just makes it hard to work with. code embedded in views is hard to test, whereas code split out into helper modules can be isolated and tested as individual units. By default, each controller gets its own helper module. Additionally, there is an application-wide helper named application_helper.rb. Rails comes with a bunch of built-in helper methods, available to all views for formatting and linking. One of the driving ideas behind Rails is honoring the DRY principle and eliminating the need for duplication. • Many pages share the same tops, tails, and sidebars. • Multiple pages may contain the same snippets of rendered HTML (a blog site, for example, may display an article in multiple places). • The same functionality may appear in multiple places. Many sites have a standard search component, or a polling component, that appears in most of the sites’ sidebars. Rails provides both layouts and partials that reduce the need for duplication in these three situations. Layouts: Rails allows you to render pages that are nested inside other rendered pages. layouts set out a standard HTML page, with the head and body sections. Inside the layout template, calling yield retrieves its content. Rails will by default look for a layout called store when the current request is being handled by a controller called store. You can override this using the layout declaration inside a controller. You can qualify which actions will have the layout applied to them using the :only and :except qualifiers. If you create a layout called application in the layouts directory, it will be applied to all controllers that don’t otherwise have a layout defined for them. Specifying a layout of nil turns off layouts for a controller. Rails supports changing the appearance of a set of pages at runtime with dynamic layouts. Subclasses of a controller use the parent’s layout unless they override it using the layout directive. Individual actions can choose to render using a specific layout (or with no layout at all) by passing render() the :layout option. Layouts have access to all the same data that’s available to conventional templates. In addition, any instance variables set in the normal template will be available in the layout. You can think of a partial as a kind of subroutine. You invoke it one or more times from within another template, potentially passing it objects to render as parameters. When the partial template finishes rendering, it returns control to the calling template. Internally, a partial template looks like any other template. Externally, the name of the file containing the template code must start with an underscore character, differentiating the source of partial templates from their more complete brothers and sisters. partials and collections. Using render with :collection and :spacer_template parameters to work in conjunction with the partials. shared templates. This makes it easy to share partials and subtemplates across controllers. partials with layouts. Partials can be rendered with a layout, and you can apply a layout to a block within any template. partials and controllers. Partials give controllers the ability to generate fragments from a page using the same partial template as the view itself. Taken together, partials and layouts provide an effective way to make sure that the user interface portion of your application is maintainable. But being maintainable is only part of the story; doing so in a way that also performs well is also crucial.